Dogs are apart of the family too, and just like the rest of your family, they need to be prepared for emergencies & evacuations! This unique large dog evacuation & emergency kit contains the items your large dog would need for up to 3 days. 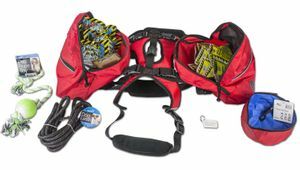 All contents are contained within a saddle-bag style harness, allowing the dog to comfortably carry all the supplies. Included water and dog food have a five year shelf life from date of manufacture. (3) Emergency Dog Food*, 8 oz. (9) Emergency Drinking Water Pouch*, 4.225 oz.